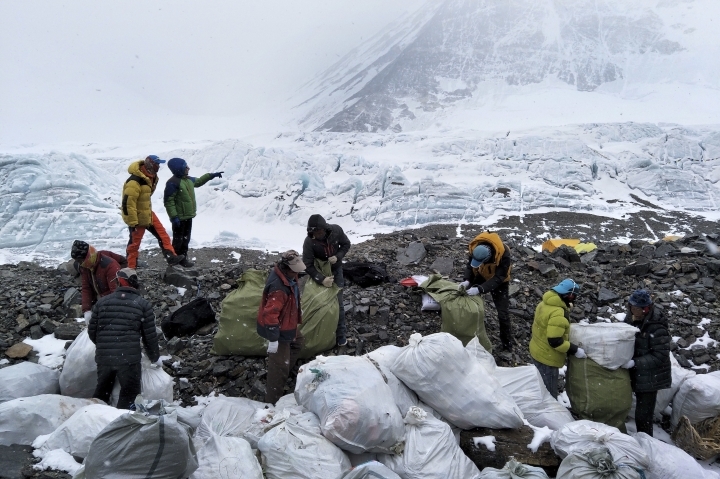 BEIJING — Workers and volunteers have collected four tons of garbage from the Chinese north side of Mount Everest in the first five days of a cleanup operation, state media reported Thursday. Hoping to find a more permanent solution, the local government in the Tibet region is setting up stations to sort, recycle and break down the garbage, which includes cans, plastic bags, stove equipment, tents, oxygen tanks and other mountain climbing paraphernalia, the official Xinhua News Agency said. The nine-day cleanup that began Saturday targets climbing trails and campsites between 5,200 and 6,500 meters (17,000 and 21,300 feet).